Bonnie Tuttle here, Federal Wildlife Agent. People tell me I have a special relationship with wild animals. They seem to listen to what I tell them and actually do it most of the time—animals, that is, not people. I've worked in Alabama for the past ten years as a wildlife agent, mostly with alligators in the southern part of the state, deer and other wildlife in the northern areas. It was a pretty good life there. But my mother was diagnosed with Alzheimers this year. 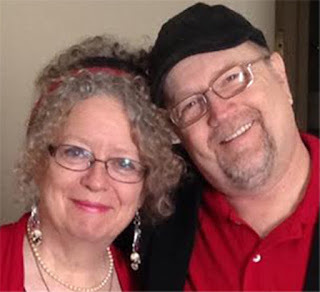 And it just so happened there was an opening in the Wildlife Agency near my home town, Christmas Tree Valley, Tennessee, by Sweet Pepper in the mountains near Gatlinburg. I'm home just in time for Christmas, but my first day here is a doozy. I meet this strange, old Cherokee man who calls me an ancient name. But I don’t pay much attention—there just isn't time. Almost right away there’s a fire on an island in Sweet Pepper Lake, and I go there with the whole Sweet Pepper Fire Department and Harvey Shelton—the man I'm replacing. In all the chaos of the fire, though, Harvey gets shot, and a wolf pup is hit by the same bullet. Poor Harvey doesn’t make it, but the pup survives. Now I have to figure who killed Harvey and why—and also find the wolf pup’s home. That is, if the killer doesn’t get to me first. It’s all a mess, but somebody has to do it. I guess that somebody is me. 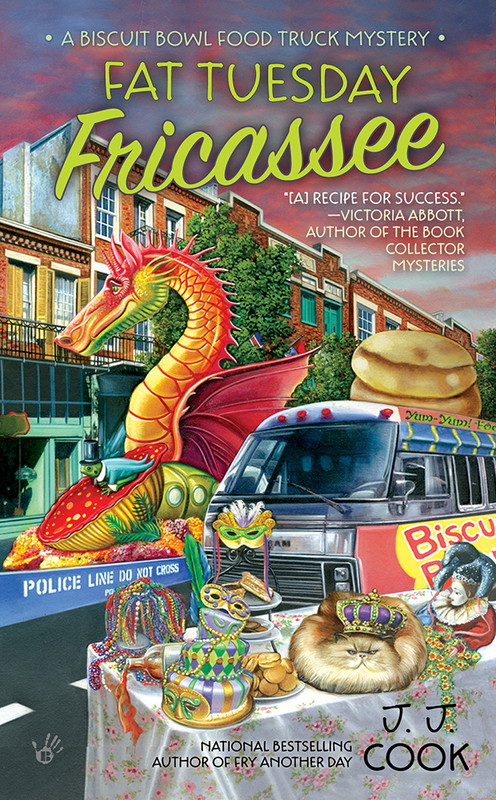 One lucky commenter will win a copy of Murder Fir Christmas and another will win a copy of Fat Tuesday Fricassee. Would love to win either one of these. Have heard so much good about both of them. Thanks for the giveaway and thanks for posting, Jim. Both books look and sound fantastic. I would love to win either title. Thank you for the chance. What wonderful books! Thanks for the chance. I would love to win either one of these wonderful books. All the reviews I've read on both are great. Thank you for the giveaway! Would love to win Murder Fir Christmas. I have the other book. I love the writing of these authors and I'd be thrilled to win this first in a new series for my home library. I already own Fricassee along with many many others by the Cooks. I'd love to win either book - both sound like terrific reads! Merry Christmas! Both of these books sound wonderful---nothing unusual there since I've enjoyed every book of yours that I've read. I'd love to win either book. I would love to win either as well. Wonderful writing from the Lavene camp, always. Thanks for the article and giveaway. Love your work! Feel the need to share with my friends for Christmas. Your covers are beautiful! Keeping your family in my thoughts this holiday season. I can't wait to read Fat Tuesday Fricasse. Would enjoy reading either book. Haven't read anything by these authors but I see lots of good reviews. I'd love to read both books. Thanks for a chance to win. I've been lucky enough to have already read Murder Fir Christmas. Great book! I'd love to read the other one. Somehow, I don't think things will calm down much for Bonnie. I can't wait to hear more of her adventures. Meanwhile, I look forward to Mardi Gras! I've read cozy mysteries off & on for a while but for some reason they've really struck a cord for the past year. I'd enjoy reading either of these books. Thanks for the giveaway! I love these authors. All the series are great. 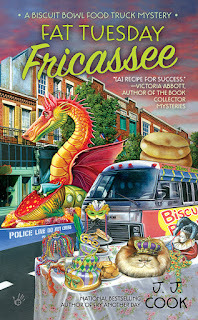 I would love to win a copy of Fat Tuesday Fricassee. Thank you for the chance. Love the article & the chance to win one of these books. I'm for all things NOLA & partial to Fat Tuesday Fricassee. Thanks for the giveaways. Sounds great...I would love to read Fat Tuesday Fricassee...and by the way I live in Alabama so that will make it even more fun. Their books are very good! I would love to win! I love all your series and would love to win either book. Both books sound intriguing, thank you for the giveaway and Happy Holidays to you both! I would be so thrilled to win a copy of Murder for Christmas...love the Sweet Pink Pepper and a crossover series is a perfect idea! Both of these books look great!! Thanks for the chance to win!! Happy holidays!! I like both books so I can't choose. I have not had the pleasure to read either. Thank you so much for the chance to win. Good luck everyone! Murder Fir Christmas sounds fun! I love the biscuit bowl mystery series! 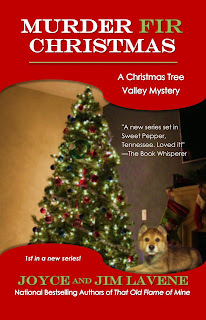 I haven't tried the Christmas Tree Valleys books yet but I am sure they are great. I would love to win either, thanks for the chance! Always enjoy a good mystery. kamundsen44ATyahooDOTcom. Wow! Thanks for the giveaway! HUG! Happy Holidays everyone! I don't have either book so I'd love to win. I do have quite a few of your other books, though. Thank you for a chance to win either of the Levine's books! I don't have either of these..would be fun to win.